We finally got first view on new modern DEV environment for NAV. This is still not finished product, but we can see something already announced on Directions NA and Directions EMEA this year. We expect final version of this tool for developing extensions somewhere about Christmas. Now the first project is public published ans all of you can download it from https://github.com/Microsoft/AL. This is just simple “Hello World”, but good enough for the first sight. Unfortunately, I didn’t download it earlier and I can just start to play with it. Just download it and be updated. I’ve finished with a first two days on Directions NA. Both of these days I had sessions and I couldn’t prepare this article earlier. I wanted to say a lot, but I couldn’t. First, NAV 2017 still didn’t official released, but finally we know when to expect. Not on Directions NA and not on Directions EMEA, but few days after that. 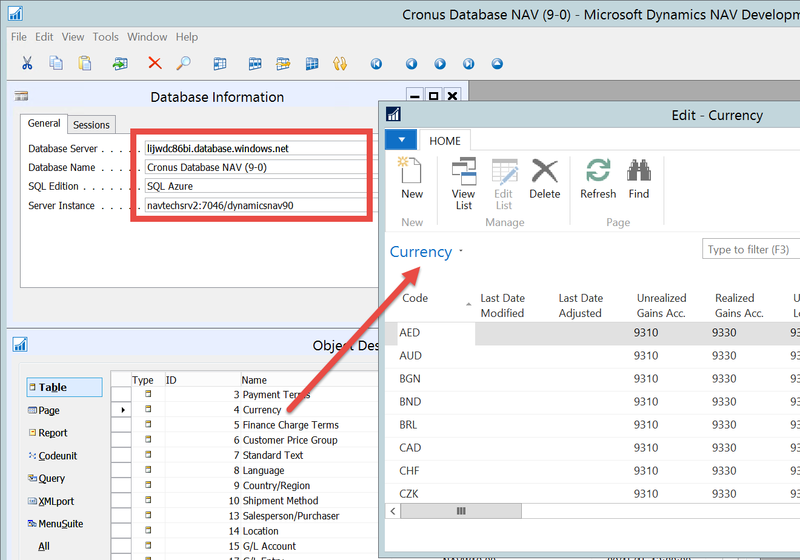 Official release of Dynamics NAV 2017 will be at October 24th. And, Microsoft also promised that we will get official release of Dynamics 365 for Financials (ex. Project “Madeira”) shortly after. OK, we will wait these dates, but generally we already know what we will get with these releases. Some of these functionalities were presented by Marko Perisic and his team on Keynote, and some of them on other sessions. I’ll noticed some of the in this article, but I’ll write more about them in the future. Now, I want to speak more about future of Dynamics because I think this is something the most important in this moment. As you can see on the following picture, we have something very interested and Paul White said “This is an AND strategy”. Based on this strategy Dynamics AX and CRM will continue to live only as part of Dynamics 365 solution. Something is not clear enough because we expect CRM as part of both Enterprise and Business edition of Dynamics 365, but AX will be part only of Dynamics 365 Enterprise edition and on other side, Project “Madeira” will be on the same position in Dynamics 365 Business edition. But NAV (GP and SL as well) will continue to exist as independent solution, in this moment available on-premises and as subscription. On the first sight this is the perfect for all NAV fans, but I need more time to be sure. In any case, we will get new opportunities and we have to learn how to make the most of them. And what about Project “Madeira” and licensing. We have some pictures earlier where we found recommended priced about 40 USD for each App. That is a true, for example if you want only Project “Madeira”, you need to pay 40 USD, but if you want some other app, for example PowerApps, you need to pay the same amount for this app per user per month. But if you want to have access to all apps (currently 4 of them), you need to pay only 50 USD for all of them as Plan model (and yes, this price will decrease with the number of concurrent users). And you can use Team Members for only 5 USD as some kind of limited users. And what is good more? If some of exiting NAV clients with Perpetual licensing model want to transit to new subscription model, he will get pretty big discount for every month. And I said that I don’t want to write about all features, but I need to notice few of them. I already wrote about Cortana Intelligence in Inventory Forecast, but now we saw Cortana Intelligence in Cash Flow Forecast; it is a perfect and you can use this in NAV 2017 and Project “Madeira” and the best is that it is very easy for using and configuring. End something more – new development environments. First you can use Visual Studio Code in the future as new code oriented environment (soon more about it). Marko presented live work with new tool. And on the end, new development tool for incredibly easy work. You just need to click on Edit button in your Web Client and you will get perfect logical environment where you can change pages, add fields to table and page… And on the end just click Stop and choose how you want to use this development… You can see all changes as preview in Web Client, Tablet Client and Phone Client. And all changes will be finished in Web Client and Windows Client, as well (of course, this is just short description – soon more about it). End again about dates, the new development environment preview will be available for Christmas. After my session on NAV TechDays about deployment of NAV 2016 on Azure SQL Server, I got a lot of questions about using Development Environment in this situation. Using Development Environment can be done absolutely normal. 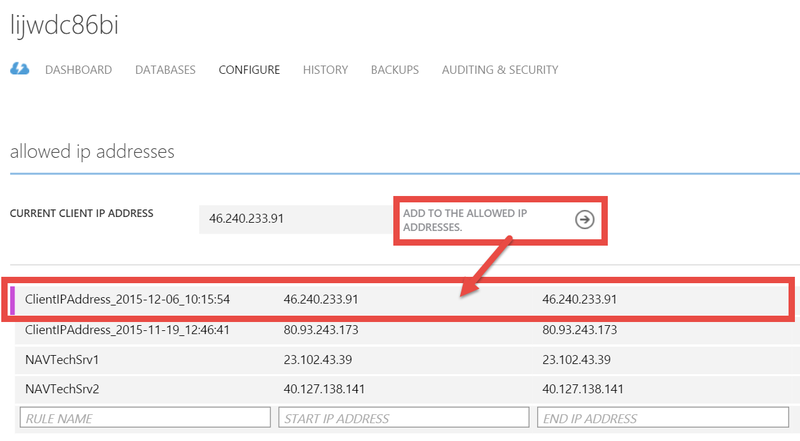 If you want to use DE from your local computer, first you have to add your IP address to Azure SQL firewall (SQL Databases > Servers > choose server > Configure). You can do it to allow connection between your computer and Azure SQL server. 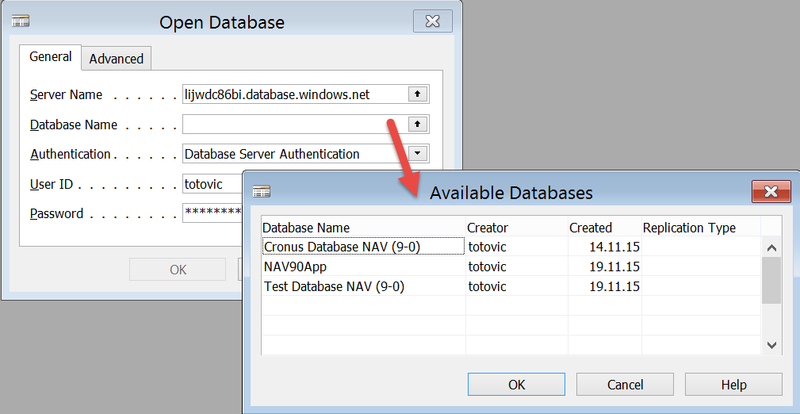 After that, open Development Environment and type your full Azure SQL server name to Server Name (xxxxx.database.windows.net), choose Database Server Authentication, your username and password and on the end normally choose your database. You can work with design, but if you want to open table for example, you have to make some additional configurations. Before it, you have to make connection between your local NAV Windows Client and Azure VM. You need to use certificate and encryption key. After you configure them, everything will be OK. If you want to use Development Environment directly on Azure VM, you just need to open DE and login to Azure SQL server (I already described), nothing else. In this situation you can work what you want. You can see it on previous picture. Database is opened from Azure SQL and you can do everything as you used to. Microsoft Dynamics NAV 2016 has finally introduced a new code editor as we used for the years on other platforms. But this time, Microsoft did a really good work. Now, it is really good editor with a lot of new features, people always ask. When we compare old and new editor, there are a lot of differences on the first sight. These are not all improvements, but some of the most interesting. Run you C/AL editor in NAV 2016 and try. Great news in NAV 2016 and really good job.